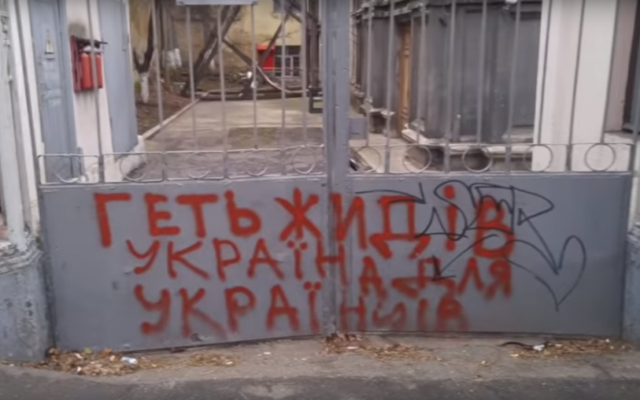 Unidentified individuals painted anti-Semitic graffiti on three Jewish institutions in the city of Odessa in southern Ukraine. The graffiti, including the words “toasting the Holocaust” on the gate of Odessa’s Holocaust museum, were discovered Monday. The city’s Brodsky Synagogue had the words: “Jews out, Ukraine for Ukrainians” written on its exterior fence. An offensive symbol appeared on a gate adjacent to the Beit Grand Jewish Community Centre. It and the other two graffiti featured the symbol of the Azov Battalion, a National Guard of Ukraine regiment that was set up after Russia annexed the Crimean Peninsula from Ukraine. Last month, an anti-Semitic slur was painted on the wall of a Jewish charity in western Ukraine. The black graffiti saying “death to the kikes” was discovered on the exterior wall of Uzhgorod’s Hesed Shpira charity, which is funded by the American Jewish Joint Distribution Committee, Eduard Dolinsky, director of the Ukrainian Jewish Committee, wrote on Facebook. The incidents follow several cases of death threats and vandalism against Jewish institutions in western Ukraine, including at cemeteries and synagogues. The incidents have taken place amid a divisive public debate in Ukraine over the conferring of state honours on nationalists who incited hatred against Jews during the 1930s and 1940s, including for some who collaborated with the Nazis.